Commerce Secretary Gary Locke returned to India’s business center today for the final stop of his high-technology trade mission to India – which he announced during President Obama’s trip last November. Locke is joined by a delegation of 24 U.S. businesses seeking to promote their technologies and services related to civil nuclear energy, civil aviation, defense and homeland security, and information and communications technology to India. Locke is the first Cabinet secretary to travel to India after President Obama’s visit. 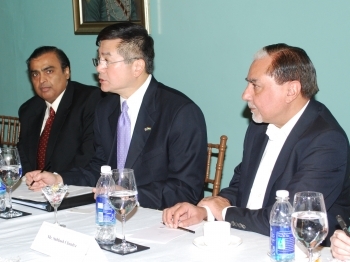 At a speech he delivered to members of the Federation of Indian Chambers of Commerce and Industry (FICCI) and the American Chamber of Commerce (AMCHAM) in Mumbai, Locke highlighted the U.S.-India commercial relationship and encouraged development of new business opportunities between the members of the delegation and their Indian counterparts. He also talked about the great progress India has made in opening its markets to U.S. companies but he noted that much more work needs to be done. While in Mumbai, Locke also met with Indian CEOs, including Chairman Mukesh Ambani of Reliance Industries, who are part of the U.S.-India CEO Forum as a follow up from their meeting during President Obama’s trip to India in November. Locke solicited the group’s goals for the 2011 forum and they discussed a wide range of critical issues, including clean energy, standards and education.